The questions elaborated upon and discussed in this article emanate from all educational levels at which education and studies in crafts appear in Finland. 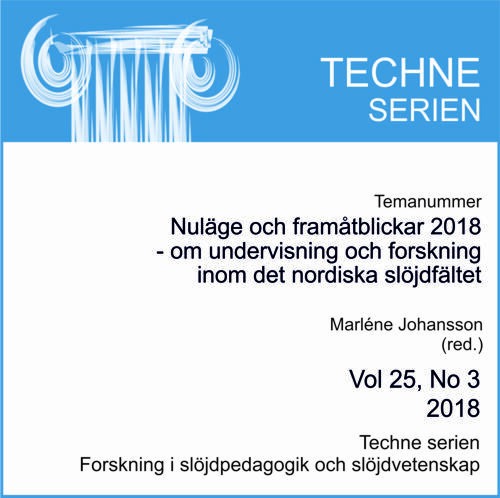 The following questions permeate the article: What is the status of Finland´s educational craft field at the end of the 2010s? What are the challenges and opportunities for crafts on different educational levels? What seem to be the trends for the future of Finnish craft education? Education in crafts at all educational levels in Finland is directly or indirectly affected by the steering documents for general basic education, which have consisted of the National Core Curriculum (NCCBE) since 2014 (Finnish National Agency for Education, 2016) and the lesson-hour distribution since 2012 (Government Decree, 2012). For the first time, the craft subject in the NCCBE has been clearly defined as one subject for all pupils with no division into textile crafts or technical crafts. This has influenced how teaching is organised and implemented. More generally, there is also an ever-increasing need for basic education to take into account the demands for lifelong learning, innovation, and the knowledge and skills to solve the problems of the future. Questions concerning the cooperation between teachers and the nature of holistic craft-based projects with content from the wide range of content in the subject must be dealt with and resolved. The effects of the curriculum on teacher education consist of the dilemma of restructuring the education and carrying out further education of subject teachers within common crafts. At the same time, universities in Finland are undergoing constant restructuring due to the strained economic situation in public finance. The Ministry of Education and Culture (MEC) steers the development of universities by allocating project funding for the cooperation between educational institutions and stakeholders in society. This has led to new ideas regarding cooperation between the four Finnish universities that provide studies in the science of sloyd education, craft, design, and technology education, and crafts science.